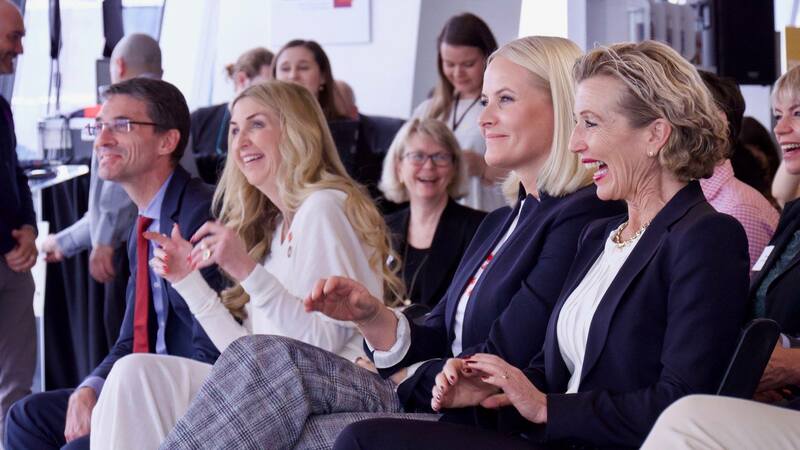 To mark this year’s International Women’s Day on March 8, I had the pleasure of opening an event organized jointly by Innovation Norway (the Norwegian Government’s most important instrument for innovation and the development of Norwegian enterprises and industry), SAP, and UN Women. As part of the Women in Data Science (WiDS) global event series, it was one of more than 30 events that are being hosted by SAP Next-Gen in 2018. While reflecting prior to the event, I thought about the progress that has been made so far with regards to gender equality. I strongly believe that gender parity is fundamental to the success of our global economy and society: it is an essential means to ensure growth, competitiveness, and the future-readiness of economies and businesses worldwide. Empowering women and girls is also key to achieving all 17 of the United Nations Sustainable Development Goals by 2030 – goals to which SAP is firmly committed. Progress has without doubt been made: we see female leaders all over the world and much has been done to break the structural, cultural, and organizational barriers that constitute the glass ceiling – but we are still far from achieving full gender parity, equality, and inclusion. The 2017 Global Gender Gap Report estimates it will be another 217 years before we achieve gender parity, given current rates of change. With 25 percent women in management, and 32.9 percent women in the workforce, I believe that SAP is on the right track when it comes to supporting gender parity. However, there is always potential to improve further, and we still have a way to go. The event at Hudson Yards was only one of the many great opportunities to help us do exactly that. Bringing together entrepreneurs, investors and thought leaders to address financial inclusion, blockchain technology, and investments in female entrepreneurs as key drivers for transformative change, the line-up of attendees and speakers was truly impressive. Her Royal Highness Crown Princess Mette Marit of Norway also spoke at the opening. The Nordic countries – Denmark, Finland, Iceland, Norway, and Sweden – can be characterized as global leaders when it comes to overall gender equality in society. However, while women make up almost 50 percent of the employed population in Norway, they represent around just 25 percent of the entrepreneurs – a challenge that, as she explained, the country needs to tackle. 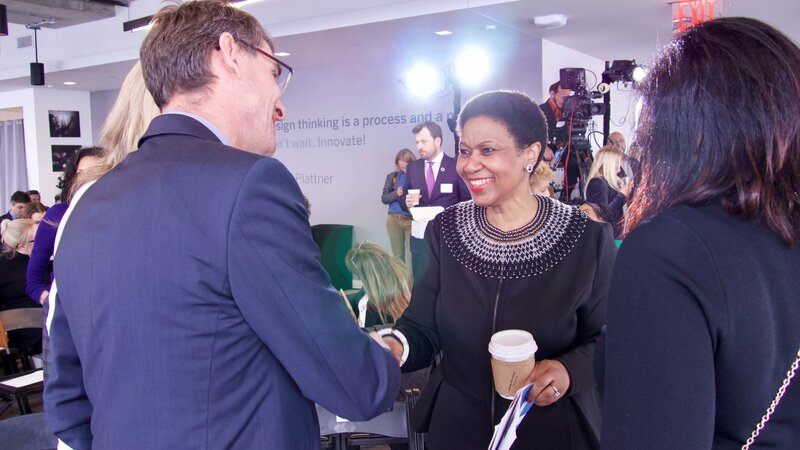 Phumzile Mlambo-Ngcuka, executive director of UN Women, spoke about meaningful innovation and the purpose-driven use of technology. Her focus on how to use technology to help people clearly shares common ground with our company vision to help the world run better and improve people’s lives. Next on stage was former NFL player Wade Davis. Working mostly with men in the sports industry, he stressed the importance of advancing change and gender equality. During his talk, there was one statement that particularly stuck out for me: Wade explained that men should care about this issue not because they have a sister, mother, or daughter, but because patriarchy creates an unjust system that oppresses people from minorities, including, of course, the LGBT community. The whole event was simply amazing, and I am very proud of the many different activities taking place to foster diversity and inclusion, both within SAP and beyond. There are numerous statistics and reports that show why this is so important for companies and indeed our economy and society as a whole. A survey for the New York-based Center for Talent Innovation found that companies that had “two-dimensional diversity” – that is, diversity in terms of race, gender, sexuality, or other inherent traits on the one hand and “acquired diversity”, such as language skills or a global mindset, on the other – are 70 percent more likely to capture new markets. What is more, according to a report by McKinsey, ethnically diverse companies are 35 percent more likely to have financial returns above their industry average. Winning new markets and performing competitively are, obviously, key to any company’s success. Since we know the positive impact diversity and inclusion can have on a business, our economy, and our society, it’s clearly a win-win situation for all involved to promote diversity and inclusion. But advancing diversity and inclusion is a matter of culture – and just as International Women’s Day goes far beyond March 8, fostering a truly diverse and inclusive culture is about making a difference every day. If you’re hiring for a tech or leadership position and you don’t have a diverse set of applicants or if you’re planning an event and there’s a lack of diversity among the speakers, don’t just accept it as a given – speak up about it. No matter how unbiased we think we are, we may have subconscious negative opinions about people from certain social groups. Recognize the patterns of your own behavior, be more aware of your own biases, and develop plans that make the most of the talents and abilities of your team members. We are never 100% aware of our own biases, that’s why listening to colleagues and employees helps us improve. Sometimes it might be uncomfortable to hear that not all of our employees enjoy the same opportunities, but you can only take the necessary steps to correct this situation if you truly understand it. You will find advocates of diversity and inclusion at all levels and in all areas of a company. Encourage and empower them. Change doesn’t just happen at the top, it’s an organic process that needs to take place across all levels of the organization.